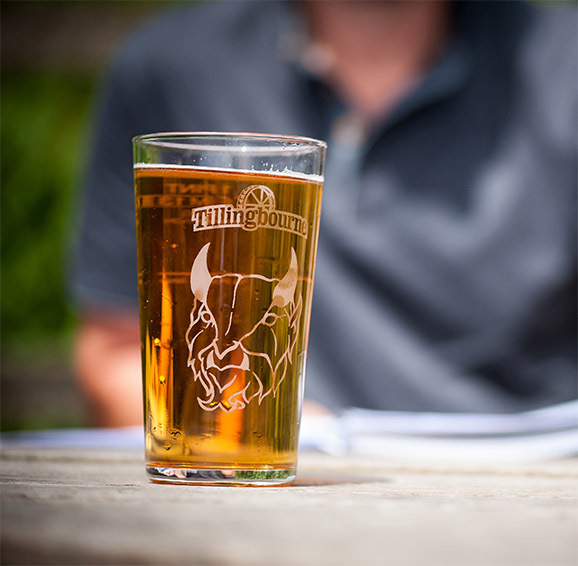 Nestled in an area of outstanding natural beauty, the Tillingbourne Brewery has an enviable location well off the beaten track and close to the picturesque village of Shere. Its name was taken from the short river which starts as a spring on Leith Hill and meanders through the heart of the Surrey Hills villages. A river in steeped in history and famous for the production of Gunpowder. When the Brewery equipment housed at Old Scotland Farm came up for sale in July 2011, it proved the perfect opportunity for chief brewery Steve to fulfil his lifelong dream of owning his own brewery. In partnership with an old school friend Lee, the purchase was complete by September and there started the major task of cleaning, decorating and upgrading the Brewery. On 19th November 2011, the first Tillingbourne brew was finally underway. With over 20 years’ experience, moving from brewing 120 pints for private consumption to nearly 5,000 pints commercially was always going to be a challenge. But under Steve’s strict quality control, we did it and without compromise. Our reputation for quality grew as quickly as our reputation for being Hop fanatics. Our passion for infusing our beers with copious amounts of hops has also become our signature. Look out for news on the CAMRA site and in the local press and magazines as the brewery grows and the word spreads.